The protective shipping container with MSG-4 is removed from the An-124 cargo jetliner after its arrival at Félix Eboué Airport near Cayenne. Arianespace’s ability to accommodate multiple missions and a full range of payloads at the Spaceport was underscored once again by the arrival of Europe’s Eumetsat MSG-4 meteorological satellite, which is to be lofted later this year by a heavy-lift Ariane 5. MSG-4 arrived yesterday evening aboard a chartered An-124 cargo jetliner that landed at Félix Eboué Airport near the French Guiana capital city of Cayenne. After a nighttime unloading process, the satellite was transferred by road for arrival at the Spaceport early this morning, where it will be prepared for pre-launch processing. The spin-stabilized MSG-4 will be orbited as one of two passengers on Arianespace Flight VA224. This continues the company’s role as the launch services provider for Meteosat platforms – which deliver vital data to ensure the safety of lives, property and infrastructure through their contribution to the “nowcasting” of high-impact weather. As with other Meteosat spacecraft, MSG-4 carries the Spinning Enhanced Visible and InfraRed Imager (SEVIRI), which observes the Earth in 12 spectral channels; along with the Geostationary Earth Radiation Budget (GERB) instrument, a visible-infrared radiometer for Earth radiation budget studies. From geostationary orbit positions at 36,000 km. above the equator, Meteosat satellites continually return detailed imagery of Europe, the North Atlantic and Africa every 15 minutes for operational use by meteorologists. 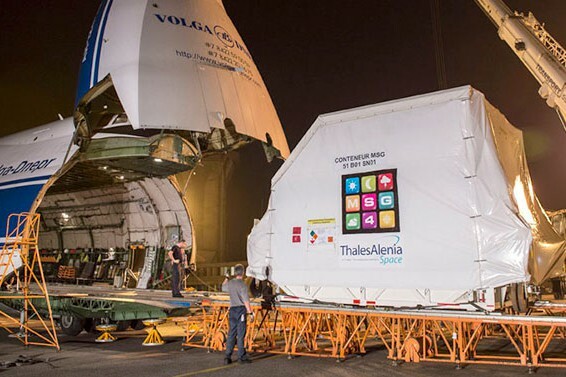 MSG-4 is the last of Europe’s Meteosat Second Generation (MSG) satellites, built by a Thales Alenia Space-led European consortium, and developed through a cooperation with the European Space Agency. After launch, it will be stored in orbit, ultimately being named Meteosat-11 when becoming operational to bridge the gap between Meteosat-10 (launched by Arianespace in 2012 aboard an Ariane 5) and the initial Meteosat Third Generation (MTG) spacecraft, which are scheduled to be orbited in 2019 and 2021. The start of MSG-4’s checkout in French Guiana joins activity at the Spaceport this month for other Arianespace missions, including preparations for a heavy-lift Ariane 5 launch in May (designated Flight VA223) to orbit DIRECTV’s DirecTV-15 and SKY Mexico-1 satellites for digital television entertainment services; and the June launch of a lightweight Vega vehicle (referred to as Flight VV05) with Europe’s Sentinel-2A Earth observation platform. Also this month, Arianespace performed an Ariane 5 mission on April 26 that carried the THOR 7 civil telecommunications and SICRAL 2 military relay satellites.